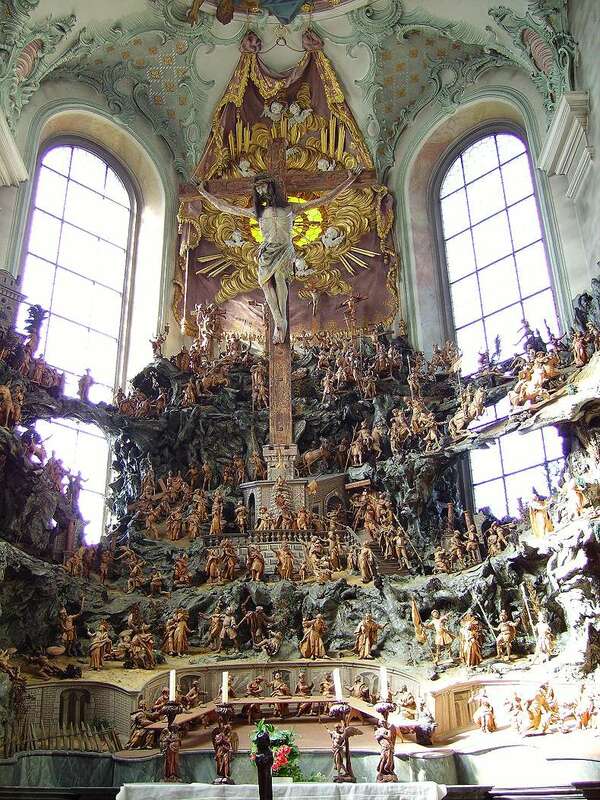 Located in a side chapel of St. Ulrich abbey, the Mount Calvary scenery is a unique example of Baroque spiritual artwork and local craftmanship. Spirituality in German speaking countries has always had a special affinity to suffering and to the dark aspects of religion, the cross is in the center of spirituality. The difference becomes obvious if you visit churches in France and even more so in Italy. Throughout northern Switzerland and Germany you will find traces of related topics like Dance of Death paintings from the late Middle Ages to the Baroque era. So the Baroque Mount calvary scenery at Kreuzlingen stands in a widespread regional tradition. It's typical for the region, but unique regarding size and quality of the artwork. Originally the scenery consisted of some 320 figures. In 1963 fire destroyed 44 figures completely, other were severely damaged. During the following decades Hermann Kohler from Kreuzlingen restored many damaged figures and carved some destroyed figures playing a central role in the ensemble from scratch Two badly damaged figures are still being shown to remember the fire.